brands and merchandise of any store, a commitment to great values throughout the store and an equally strong commitment to making shopping fun. 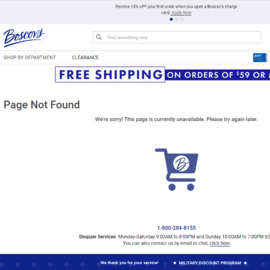 Boscov's Online mirrors the experience you would find at any one of their 42 stores. No cash back on Boscov's gift cards & advanced sale items. Click a Coupon or click Start Shopping to earn 4% Cash Back at Boscovs.